The 37th Tokyo Motor Show--Passenger Cars and Motorcycles--closed its doors on November 5 after a successful run that demonstrated the appeal of the new audience-participation format. During its 13-day viewing the show recorded 1.42 million visitors, significantly higher than the previous show (1.27 million). Not only did this mark an end to the prolonged decline in attendance brought on by Japan's economic slump, it also provided impetus for stronger sales in the automotive industry. The show's success is attributed to better vehicle exhibits and to a change in format from a "display-oriented show" to an "audienceparticipation show." Looking back over the show, one of the trends that stands out is the number and breadth of non-Japanese visitors. During the two Press Days, the show was viewed by 12,300 members of the press, of which 4,700 were from overseas. Part of this is attributable to the globalization of the automotive industry, but it is also significant that the rapid growth of the Chinese automotive industry is bringing more Asian reporters to the show. Visitors had generally good things to say about the exhibitions. Passenger cars and motorcycles had a combined 192 world and Japan premieres, world-class levels that increased visitor excitement. Exhibition content tended to focus on" environment - friendly advanced technologies," and exhibitors tried to communicate their own distinctive insights on the basic joy and fun of driving. These efforts apparently resonated with visitors. Many responded favorably that the show was" worth seeing" and "felt fresh." 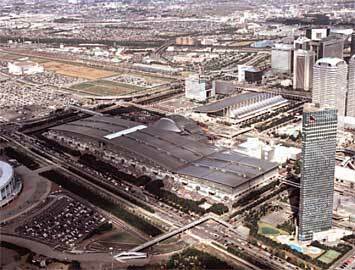 Efforts like these on the part of exhibitors helped more people to understand the intentions behind the new-style Tokyo Motor Show. The fact that attendance continued to increase throughout the show period indicates that this year's experiment was indeed successful. Also helpful were the show's attempts to cater towards the next generation of drivers, offering free admission for elementary school students and younger, and half-price admission for high school students, which resulted in large numbers of young people and families throughout the show period. Special events made use of all of the venue's facilities, and they too were given high marks. Clean Energy Vehicle Test Rides, the "Traffic Moral Saver Anzenger" show and the" Fiesta Mariscos" live cooking show were packed every single day. The Carrozzeria Exhibit and the symposiums recorded large numbers of visitors as well.